Wicker and rattan are grasses, which don't have the same permeability as wood, so you may not get the results you expect when applying stain. Stain basically consists of pigment suspended in a solvent -- much like paint -- and if the pigment can't penetrate, it remains on the surface where it dries and eventually gets rubbed off. If you want to darken the color of wicker or rattan furniture, you'll get more even results if you use a dye, which has better permeability. You can't brush dyes easily, though; it's better to spray them. Dyes will tone your wicker or rattan, even if they are already finished. Clean each piece before you stain it. To remove dirt and grime, wash with a solution of one ounce of weak detergent, such as dish soap, per gallon of warm water. If the furniture is moldy, add 1/2 cup of bleach to the solution. Use a toothbrush to get in crevices between the weave. Wipe down both the top and underside of each piece you plan to stain, then let it dry in the sun. Scuff-sand the piece if it has a worn lacquer or varnish finish; dye can penetrate a finish that isn't too heavy. If the piece is painted or it has a heavy varnish coat, however, staining or dyeing probably won't be successful. It's a better idea to simply repaint or revarnish. Prepare a dye solution by mixing the dye powder with the appropriate solvent. 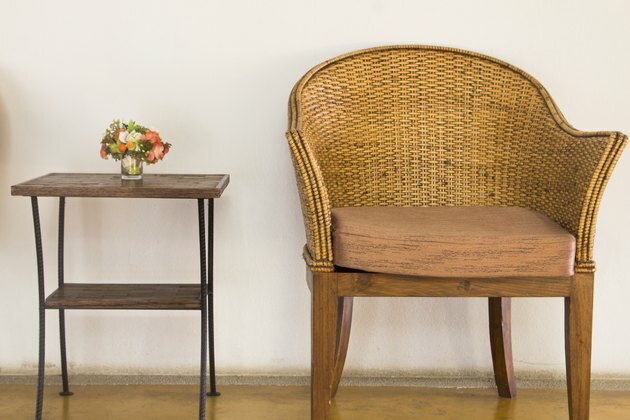 You can color wicker with water-soluble dyes, but the best wood-tone colors -- which you can find at paint stores -- are usually soluble in alcohol. Follow the instructions on the dye container when mixing. Strain the dye mixture with a nylon filter to remove solid particles that didn't dissolve and transfer the dye to a spray bottle, such as you would use to mist plants. Test the sprayer on a piece of cardboard and adjust the nozzle to produce a fine mist. Place the piece of furniture on newspaper and cover anything in the vicinity that you don't want to spray with plastic, masking paper or tape. Turn the piece you're dyeing over and spray the underside first. Mist the dye evenly to obtain a uniform color while avoiding puddles. Dye soaks in quickly -- there's usually no need to wipe off excess. Set the piece upright and spray the top when the solvent has evaporated, which takes from five to 15 minutes, depending on the solvent. Let the piece dry for about an hour. If you want to give it a glossy finish, spray it with one or two coats of clear lacquer or polyurethane finish, using an aerosol can.